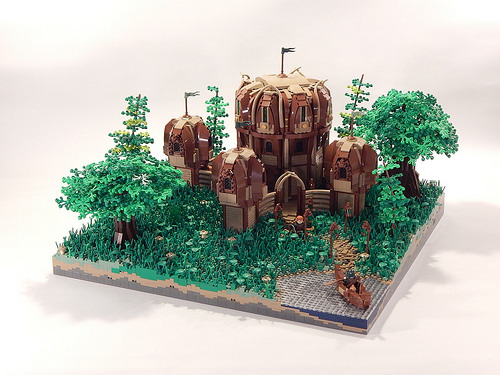 The Elven Fortress of Valahadrian is located deep in the Mystic Isles of Avalonia, and was created from the imagination of LEGO builder Tirrell Brown. The tan and reddish brown colour combination fits well into the green woodland landscape surrounding the fortress. I love the unusual circular construction with overgrown arches to give a really organic feel to the architecture. Tirrell has clearly spent time on the trees and greenery to bring the whole build together, resulting in a lovely vignette. There’s a story unfolding before our very eyes with the rowing boat arriving and someone awaiting the visitor’s arrival. I can’t help but draw your attention to the multi-layered base mimicking the differing grass, soil and water layers — a very nice detail!